I shared some pictures of my other grands on Monday but Baylor is sometimes hard to capture in a photograph. I texted Katy and asked her to send me some from her phone. And she did! I wanted to thank you all for praying regarding Baylor's education this fall. Hoover school system did come up with a transitional kindergarten for some special needs children who are not ready to be mainstreamed but they have the potential to be prepared for entering regular classrooms. We are so happy for this option for our spectrum boy. ( For those of you who are new readers, Baylor is our six year old grandson who is on the autistic spectrum.) Katy also reported that Baylor has made huge strides in his speech in recent weeks. We are so happy to hear that, while he does say certain words, he would be classified as non verbal for the most part. So here is our Beautiful Boy. He has such a sweet spirit and a lovely innocence that is quite refreshing in our present culture. I am going to have to frame this one. Loving on Elliott at the grocery store. This one melts my Nana Heart. This boy loves water! You may notice his little bracelet. It gives his name, address and states that he is non verbal. It provides a lot of peace of mind for Ben and Katy. He has always struggled with sleep. Katy says that seems to be improving as well. We are thankful for each step forward this little man is making. Grandpa and I are very proud of our Baylor Man. All of those pictures are wonderful. Every step is a good one. So happy that the school system is working for it. It is a huge need. What beautiful photos of a sweet young man! 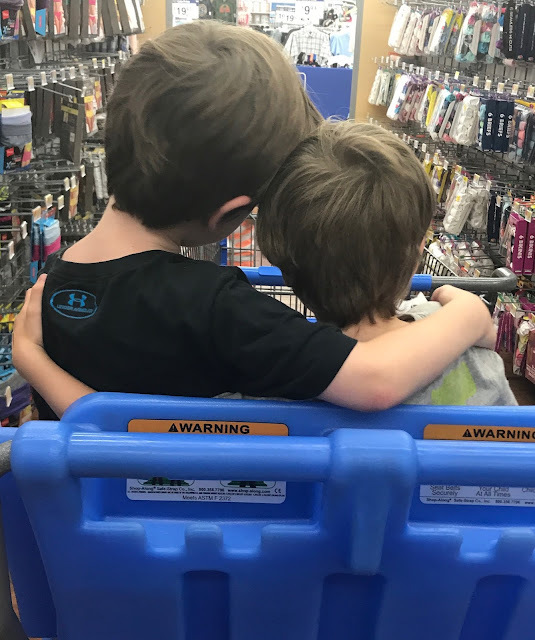 I love the photo of him and his brother from behind in the grocery cart. I am glad the school system is putting together a transitional program for him and others. Since I am new (and I don't want to assume), have they tried using sign language to enable his language capabilities? What a treasure of a boy. Big prayers for new skills and adventures for Baylor. Thanks y'all...he is a sweet fellow!! Robin, they have tried just about everything. His therapists think he might be playing them. He does understand just can't or won't speak. And I do believe that every Autistic child is different in their perceptions and capabilities. Baylor does say Grandpa consistently...he has loved his Grandpa since he was small. 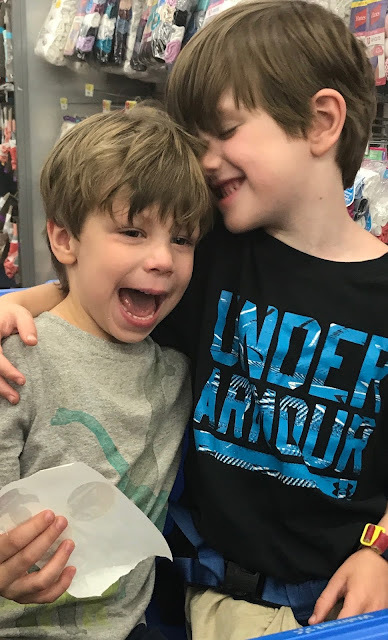 Grandpa always takes Krispy Kremes when we go to see them as Baylor loves them so, if Grandpa doesn't have any, Baylor will look at him questioningly and say"Donuts?" We try not to let that happen. :) I think one of the hardest things about autism is that you cannot know what the child will be able to accomplish as they grow older. The whole spectrum is surely a Puzzle. Baylor is so precious and those photos are wonderful! The special kindergarten sounds perfect. Please keep us posted!